As Union soldiers raised the Stars and Stripes above their garrison in Tennessee they could have had little inclination of the coveted place their flag would one day hold among treasure hunters – requisitioned not for battle, but for Civil War and history enthusiasts. So too must the over 3.8 million Americans who saw military service in both the Union and Confederate militaries, approximately 11% of the entire population of the United States, have thought little of how popular their buttons, hat insignias, pocket money, or rifle parts would one day become. Even mementos made for sharing like ambrotype portraits, would never have been considered for wide spread public consumption. Rather, historians posit that awash in a sea of mass killing and death, photographs and portraits served to individualize the Civil War in a way that reconciled individual participants to the grim reality surrounding them. During the war, these pictures were personal, just like the countless pieces of weapons, uniforms, and personal artifacts. But that would change. Flags flew in the face of major conflicts during the civil war. Upper Deck is planning on giving collectors the opportunity to own part of one. 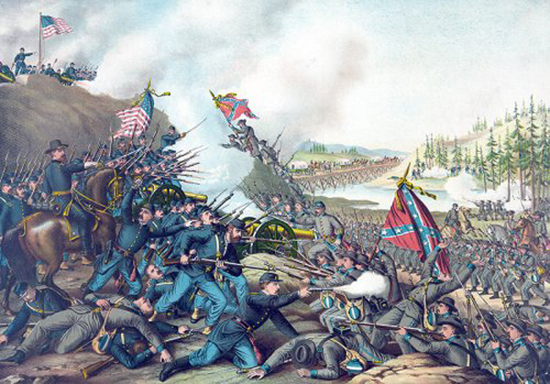 A public interest in all things Civil War has a long history in the United States. Indeed almost as soon as it ended a public fascination with it began. During the Civil War and in its immediate aftermath most interest took the form of public memorialization as Americans, black and white, North and South, attempted to come to terms with the meaning of the War’s outcome. By the 1880s soldiers’ autobiographies were all the rage and in an increasing cultural movement toward reconciliation, veterans’ units met to exchange stories, return flags and equipment, and generally reflect nostalgically on their battlefield experiences. Over time the Civil War appeared as a subject in more popular forms of culture, particularly as Hollywood burst on the scene after the 1915 release of “Birth of a Nation.” A renewed interest in Civil War artifacts surrounded the 100th anniversary celebrations and by the 1980s, collectors, artists, and re-enactors had become part of a full-fledged nostalgia industry. Interestingly, these market-based forms of Civil War memorialization tended to emphasize Confederate themes and only a select few Union “heroes.” For example, since 1990 the ratio of Confederate subjects to Union in popular art is 2.5 to 1. All told, since Lee’s surrender in 1865, the popularity of the Civil War has grown to become a powerful industry of memorabilia emphasizing the “great leaders,” battlefield experiences and military aspects of the conflict. 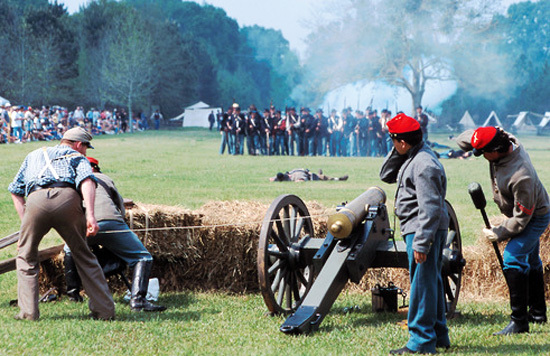 Civil War reenactments have remained a popular way of memorializing this historic conflict. What Upper Deck has done with this collection is both a reflection of this long historical trend and a departure from it. They have assembled a truly impressive and unique set of Civil War memorabilia, especially from the point of view of the average, every day soldier. 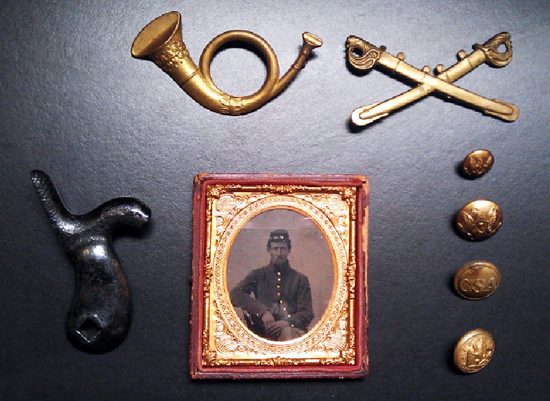 From the Union side we find buttons, brass cavalry and infantry hat insignias, hammers from rifles, and ambrotypes. Each of these items tells a story – a button with a company letter, a regimental insignia, the face of a young man sent off to war. 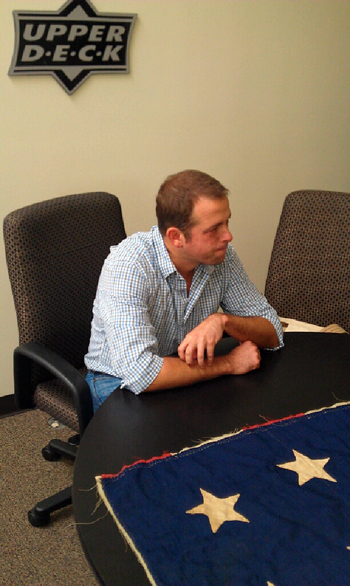 Most impressive perhaps is the center piece of the collection – a Union Flag actually flown on the field of conflict. This flag bore witness to the very personal experiences of some of the War’s participants. In this way, it reflects the common soldier and all complexity of war. At the same time, the flag bears witness to the values for which those men fought, varied as they were. It reminds us that the War meant something to everyone who participated. Professor Miller talks to Upper Deck staff about some of the Civil War collectibles the company had acquired for use in the 2012 Goodwin Champions set. 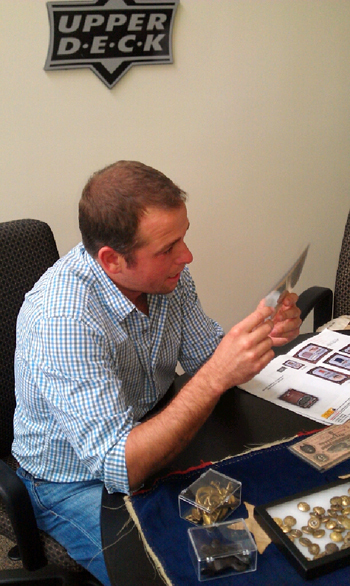 Upper Deck shares the company’s rare Civil War artifacts with Professor Miller. A close up look at some of the Civil War items Upper Deck was able to procure for use in the Museum Collection cards found in 2012 Goodwin Champions. And from the Confederate side we find in this collection similar personal effects. There are buttons and insignias – reminders of the units that saw action – as well as actual Confederate money. This currency tells a story in its own right. In the big picture, it reminds us of the economic hardship visited upon most Southerners during the War. 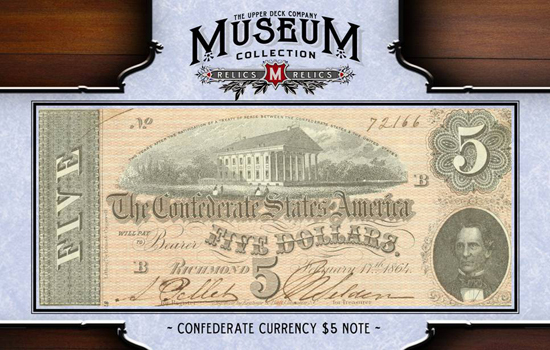 The images on these bills reflect the values and goals of the Confederate nation. On a smaller scale, one cannot help but recognize that someone carried, touched, and used this money. Again, in the almost overwhelming scale of the War, it becomes personal again. And finally there is the soldier’s wallet; a piece that remains unidentified but embodies the facelessness and commonality of the partisans – it could be a soldier from either side. It could have been a slave owner’s, used to keep his profits, as much as it could have been a free slave’s, used with pride to hold his first wages. These Civil War artifacts will be housed in shadowbox cards and available as a redemption to collectors lucky enough to find them. Of course no Civil War collection can be exhaustive – the diversity of participants, the range of ideologies, and the scope of the engagements makes that unlikely. But in this set you see a spectrum of personal items from both armies that to my mind identify the individual soldier as much as represent the faceless millions who served. In this sense, it personalizes what was truly a conflict of immense scale. You too can have a piece of that history and as such, these cards are a must have for any Civil War or History enthusiast. Look for them in 2012 Goodwin Champions arriving in stores on August 14. David Miller, Ph.D. has been with the University of San Diego since 2005. His research focus is the social and cultural history of the nineteenth-century United States and he offers courses on the Civil War and Reconstruction. DO NOT… and I repeat DO NOT cut up the flag! No matter how tempting a relic card with piece of Old Glory might be I would suggest thinking twice. You would face the wrath of millions! If the flag is to be given out it should be given out as one piece- that is framed. Ernest, it was already torn and cut when we purchased it. The image you are seeing is not of the entire flag. Had it not already been cut, we would not have purchased it to use in this set as we agree with you, something like that should be preserved. As this flag had already been torn and cut, it is the perfect type of item to use in a set like this. Yes, I had the same concerns! But as Chris said, the whole team at Upper Deck and I agreed that since the flag was already cut up, torn, and therefore incomplete and in several pieces, it would actually be a respectable way to preserve and honor a flag that was otherwise essentially destroyed. Civil War collecting definitely walks a fine line between entertainment/personal enjoyment and honoring those who participated. I think that all of these items will receive the respect they are due in the homes of private collectors who treasure and truly understand them. Really looking forward to goodwin this year! Hopefully I can pull one of the Civil War relics! I would love to get that flag! Holy crap that flag will be awesome!!! I think, that the flag should be shared with everyone…….. Professor Miller was my history teacher last year at USD! Great teacher and very nice person. HUGE Upper Deck fan and this is just awesome.